It has been known for 25 years that nephrolithiasis occurs more commonly in patients with intestinal disease than in the general population (Deren et al. 1962; Gelzayd et al. 1968). 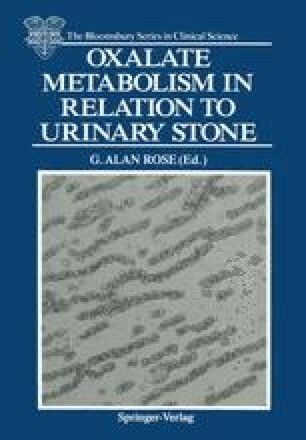 The majority of stones in these patients are composed predominantly of calcium oxalate (Gelzayd et al. 1968), and a mechanism to explain this observation became apparent with the demonstration about 15 years ago that individuals with ileal disease or resection excrete increased amounts of oxalate in the urine (Dowling et al. 1971; Admirand et al. 1971; Smith et al. 1972). The aim of this paper is to review present knowledge about the cause, clinical significance and treatment of enteric hyperoxaluria (EHO). In the course of a resumé of pertinent aspects of oxalate metabolism, other types of secondary hyperoxaluria will be briefly mentioned.